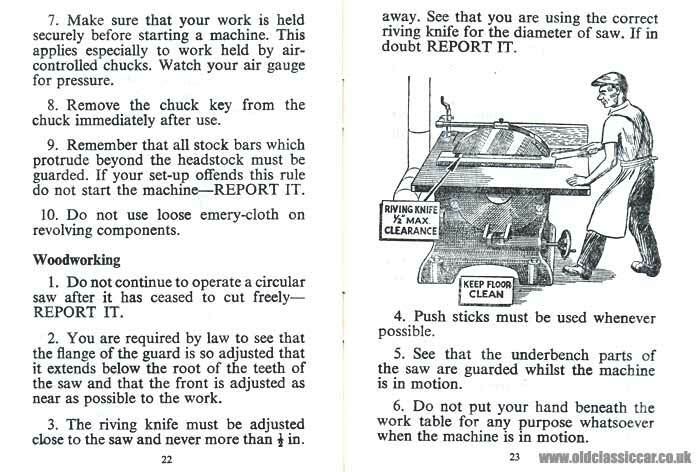 Workplace safety at the Austin and Morris (BMC) car factories in the 1960s. Homepage. This page: A pocket-sized booklet which describes workshop 'best practice' at BMC. Workshop safety at BMC car factories in the 1960s. Health and Safety regulation influences virtually everything at the modern motor-car factory, from the factory floor to the car park, from the canteen to the cloakroom. In the 1950s/1960s such regulations were much less onerous than today, but even so there were trilby-wearing gents, brows furrowed, patrolling the car factories of Britain, clipboards in hand, peering through their wire-framed spectacles, ensuring that workers on the shop floor were behaving themselves, and not putting themselves - or others - at undue risk. The pocket-sized booklet shown below, which probably dates to the late 1950s or early 1960s, was issued by the safety officers of the British Motor Corporation (BMC) to all employees, in a bid to prevent accidents occurring. Presumably this copy was once owned by someone on the factory floor at BMC, quite possibly someone building cars or car components at the Austin works in Longbridge, or doing a similar job at the Cowley plant. 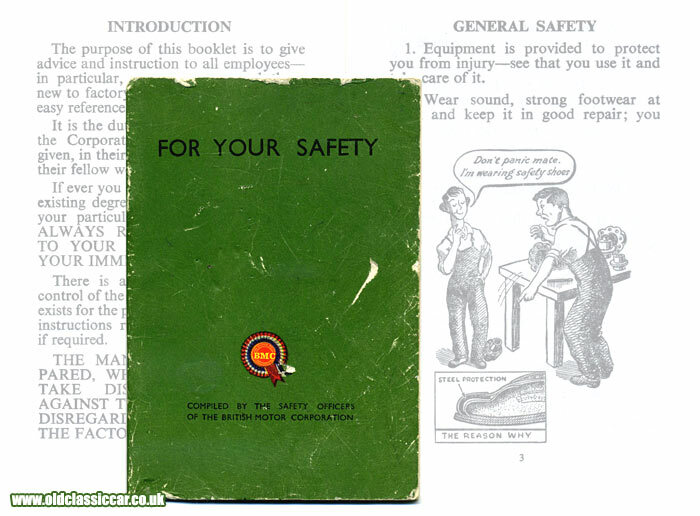 The booklet, titled "For Your Safety", was printed by the Nuffield Press. The content of this booklet is based on the Factories Act, an Act that was updated in 1937, 1959 and 1961, giving a clue as to the date of this publication. The information is grouped by category, this includes sections for Acids, Cyanide, Electric Tools, Paint, and Vitreous Enamelling to name just a few. Accompanying the text are various illustrations, again designed to remind factory workers that they were in a dangerous environment, where one slip or item of loose-fitting clothing could spell disaster, or at the very least a stern talking-to from management and a visit to the first aid officer(s). Much of the advice, for instance that regarding the lifting of heavy objects, general tidiness, and using ladders correctly applies as much today as it did then. More interesting though are the entries that relate to trades that have all but disappeared from mainstream car manufacture today. Splinters and nails for instance, both no doubt frequently encountered by tradesmen working on older ash-framed cars, and those that featured wood fittings in their interiors, were both things to be wary of at this time, but would today only be a concern for skilled craftsmen and women at the likes of Morgan, or in restoration emporiums. Tips on the operation of circular saws and band saws applied to the joinery department in particular, with a recommendation given that "push sticks" should be used by circular saw operators wherever possible, to distance the operator from the spinning blade. Several items act as a reminder that even in the 1960s, many of the processes employed in the manufacture of cars and car components, were handled in-house and not necessarily farmed out to outside companies. Workers in the Plating and Hardening Shops for instance, were warned of the grave dangers of cyanide, while employees actively involved in the vitreous enamelling of car parts, were told to always wear a respirator, and wash hands before partaking of food. Most of the items of paperwork relating to Austin and Morris cars that I've accumulated over the years, relates to the finished product, their sale, and their maintenance once out on the public highway. This small publication though sheds some light on the environment in which such classics as Austin Cambridges, Minis, Morris Minors and 1100s were actually constructed, and for that reason makes it an interesting item to flick through. Click here to read about other old items of automobilia, and ephemera relating to cars and garages.